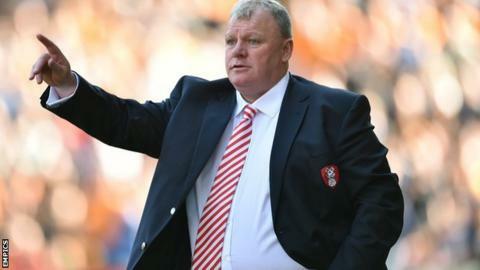 Rotherham United manager Steve Evans believes his side have proved people wrong this season by reaching the League One play-offs. The Millers, promoted from League Two last term, face Preston over two legs after finishing fourth in the table. "Most people thought we were more likely to be relegated than to be competing for the play-offs. "They've been magnificent and the bulk of the group were here in League Two," he told BBC Radio Sheffield. "We said two years ago when we signed a lot of the players that they would have the ability to take us out of League Two and challenge in League One. Our judgement has been proved right. "We hope they can see it through now, but we know how hard that is going to be." The New York Stadium side have spent the majority of the campaign in the top six and have lost just three of their 22 matches since the start of the year. However, Evans believes his side go into the play-offs as outsiders for promotion. "Preston are a big club with big resources and you only need to look at their playing squad to see they have seven or eight strikers," he said. "Russell Slade has had a long time at Leyton Orient building his side and Peterborough started this season with aspirations of getting automatic promotion. "Quite rightly, we're the underdogs of the four but we all know that in sport the favourites don't always win."